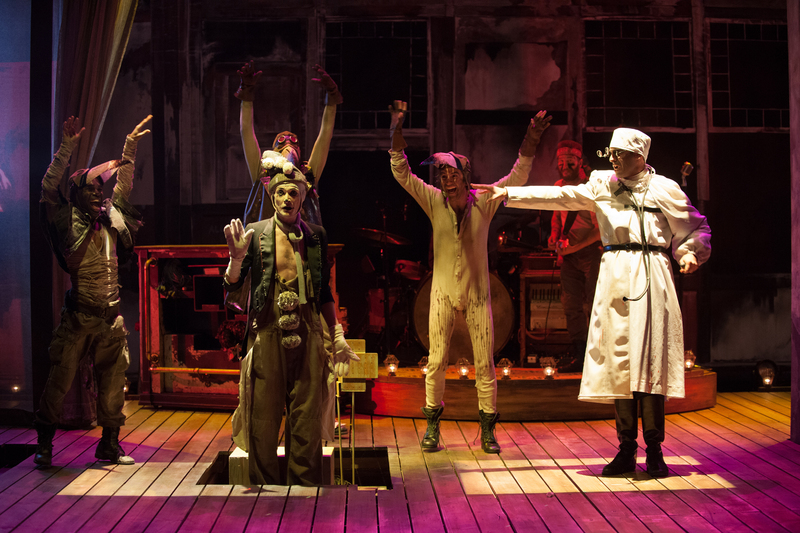 Ramiz Monsef (right) as the Doctor, Cristofer Jean (Center, on trapdoor) as Koko, and ensemble. Photo by Jenny Graham. Photo courtesy Oregon Shakespeare Festival. In recent years, musicals have departed from traditional structure and composition methods, exploring the use of numerous musical styles to tell a story. 2008’s Tony Award-winning In The Heights used hip-hop and Latin pop styles, each character representedy by a different form of inner-city Brooklyn music, while Fela! told the story of African musician Fela Kuti with his traditional tunes. The Unfortunates, currently in its premiere performance at Ashland, tells a bitter, simple story using that classic American art form: The Blues. The play concerns Big Joe, former right-hand-man to King Jesse, underworld boss and owner of King Jesse’s Kingdom, a bar/casino/brothel that caters to the baser desires of whoever walks in. When Jesse dies from a plague, Big Joe is given the crown, but he is as soft-hearted as he is big-fisted and finds it difficult to maintain what he’s been given. Meanwhile, he attempts to pursue a relationship with Jesse’s daughter; however, when she contracts the plague as well, Joe’s life is turned upside down. The musical draws many of its devices from other musicals, but employs them together in a way that makes it a truly unique performance. The closest musical I can think of is Kander and Ebb’s Kiss Of The Spider Woman: Both use a fascist prison where death awaits at every turn as a framing device, and both protagonists escape their terrifying circumstances by disappearing into the realm of their imagination. However, The Unfortunates improves the formula: Joe's imagination torments him just as much as the foreign soldier outside the cell and the soundtrack uses a musical style able to convey more angst than the tango. Big Joe’s mental landscape is bizarre and circus-like (Joe himself dons immobile, Hulk-sized fists in his mind), but as much as its inhabitants are cheery and love to joke, there is a noticeable grim current at the back of every scene. If you are going to the Oregon Shakespeare Festival, it would be a shame if you missed The Unfortunates, which, if it weren’t for OSF’s astonishing Streetcar Named Desire, would far outpace the others as the greatest play of the season.